The strong and silent type. EVGA just updated its Supernova power supply line with a third generation series, the G3. Compared to the Supernova G2, the new Supernova G3 PSUs purportedly offer even better performance in a smaller profile that should make fitting these units in tight confines a little bit easier. "With these new power supplies, EVGA took the best features of the award-winning G2 lineup and made them even better. 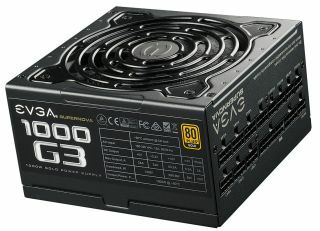 The Supernova G3’s smaller size, improved performance and a new hydraulic dynamic bearing fan give you ultra-quiet performance with an increased lifespan," EVGA says. Both the Supernova G2 and G3 are 80 Plus Gold certified, though EVGA says it was able to improve efficiency on the G3 line to over 91 percent and reduce ripple. While those are minor improvements, the primary selling point is the size. The G3 is noticeably smaller than the G2, measuring just 150mm in length even for the 1,000W model, compared to 200m for the G2 (and 220mm for the 1,600W G2). At that size, they should be compatible with most cases, and having modular cables helps with tight fits, too. A smaller footprint means also means a smaller fan, which in this case is a 130mm hydraulic dynamic bearing fan. It's turned off for silent operation during low to medium loads in Eco mode. If ordering direct from EVGA, there's currently a $10 instant rebate on the 550W, 850W, and 1000W models. All five are in stock and ready to order.